Description: Tired of the same old exam pieces? Need a bit of light relief? Looking for something to bridge the gap between grades 3 and 4? This book is perfect for you! 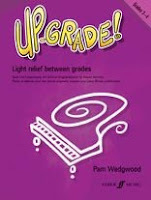 Pam Wedgwood's inimitable style is guaranteed to breathe new life into your piano playing - the varied pieces in this bright new collection range from toe-tapping jazzy numbers to more classical styles, all designed to ease you gently on towards the next grade. So lighten up and move on with Up-Grade! Icoger eltoro por los cuernos!